The North Texas polo team won their first Victory Cup against Texas Christian Saturday afternoon by a final score of 5-2 at Prestonwood Polo Club. The team, made up of only three players, consists of Turner Wheaton, Vaughn Miller Jr. and Andrew Scott. During the first chukker — which is similar to a quarter of play in football or basketball — Miller Jr. scored the opening goal for North Texas. The polo match consisted of four chukkers, all played for seven minutes each. All three players scored for North Texas, demonstrating a versatility amongst the group that is not always there in polo. Miller Jr. said the team is starting to play very well together. 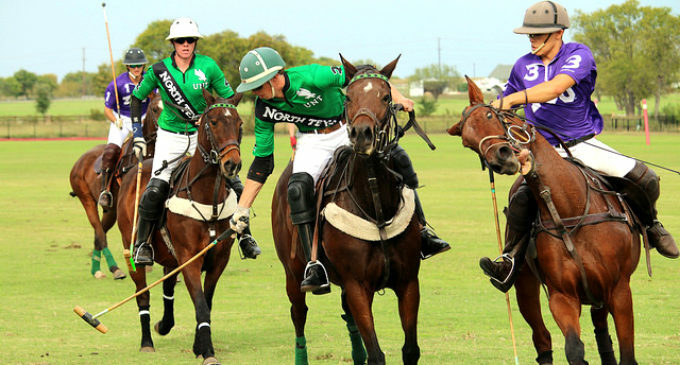 North Texas led the first three chukkers with five goals and didn’t allow one goal to Texas Christian. During the final chukker, Texas Christian responded with two goals of their own, but it was not enough to come back against North Texas. Miller Jr. competed in the National Youth Tournament Series in September and helped bring home a national championship while representing Texas in the tournament for 19-and-under players. His father said this tournament is the best of the best, and there are dozens of unbelievable players that compete at this tournament. Miller Jr. not only helped bring a national title to Texas, but he also won MVP of the entire tournament. The polo team will travel to the University of Virginia this coming Friday to take on the No. 1 collegiate polo team in the nation. “When we play Virginia, it will be a test to show us how good we really are,” Miller Jr. said. I know Prestonwood Polo Club holds events for charities a few times a year I was involved in one not long ago. I did not know much about polo, but I do know horses. The one on the right of this picture is in pain you see it in his eyes. I did not know this was something that occured. I will continue to help with various charities, but will avoid polo matches. I do not care if you approve this or not, but I would suggest taking this picture down.There are Pepole who love and care about animals and would not appreciate seeing one in pain as this horse is.